APEX has turned 18 (ish) and EA-2 is now available. In this post, I will introduce a brand new (very small) feature of APEX 18.1. APEX has had some support for consuming web services even before it was a shipped product (even before it was called HTMLDB). With this release of APEX, Carsten Czarski has made consuming RESTful style web services and the new ORDS REST Enabled SQL feature a breeze. You can read all about this new support in a series of excellent blog posts by Carsten here. Also introduced in this release is a log of all web service requests made through APEX. Whether they are made through the greatly improved RESTful Web Sources and Remote SQL, the legacy web service REST and SOAP web references, or either the APEX_WEB_SERVICE or APEX_EXEC PL/SQL API, the request is logged. This log can be useful for workspace administrators and developers to get a glimpse of all web service requests being done by the workspace. The view APEX_WEBSERVICE_LOG contains the log information. As a developer or administrator in a workspace, you can query this view to find the URL, method, request content length, HTTP status code, response content length, the time in seconds between request and response, the date of the request, and the user making the request. To find a description of all the columns in the APEX_WEBSERVICE_LOG view, you can go to the Data Dictionary report in SQL Workshop Utilities. The logging of all web service requests is even more useful for administrators of the entire APEX instance. If you are running a hosting business, this log can be used for forensics in case any of your tenants used your service as a launch platform for attacks on other systems. There is a handy interactive report on the log available in Instance Administration - Monitor Activity - Web Service Activity Log. By default, there is a log switch every 14 days, so you will have about 28 days of log. 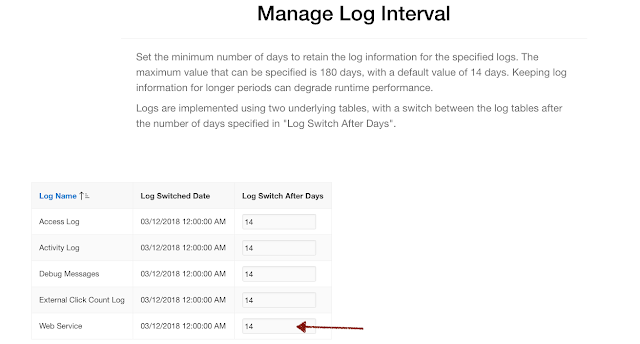 If you need to retain information longer than that (or not as long), you can change the default at Internal Administration - Manage Instance - Manage Log Interval. And finally, also handy for hosting or cloud providers, you can set the maximum number of web service requests that each workspace can do in a twenty four hour period. You set the maximum in Internal Administration - Manage Instance - Security - Workspace Isolation. You can also override the instance setting at the workspace level. 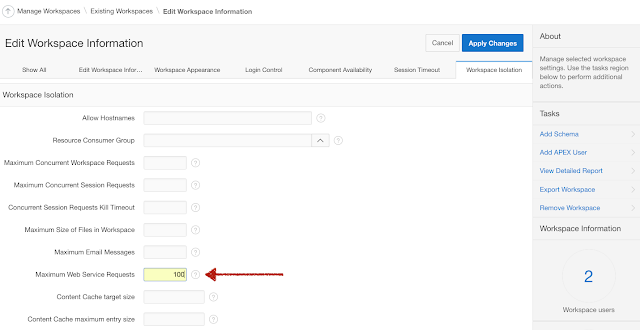 In internal Administration, go to Existing Workspaces, find the workspace, and click on the workspace name to edit the properties. Set Maximum Web Service Requests under Workspace Isolation. And there you have it, your 18.1 new feature "nugget," logging web service requests. I hope you find it useful.